The 6th European Communication Conference is about to begin in Prague, Czech Republic. The event is arranged by the European Communication Research and Education Association (ECREA), and is entitled “Mediated (Dis)Continuities: Contesting Pasts, Presents and Futures”. Most of the preconferences will start today, but the earliest have already finished. As suggested by the conference’s heading, the event hosts a myriad of sessions related to practically all areas of communication studies. It boasts contributions from over 30 sections – and the Journalism Studies section alone holds 30 sessions plus a business meeting! Its selection covers everything from local to global perspectives, from political reporting to news games, and from journalism’s praxis to its norms and ethics. The official programme will begin with registration and a plenary session tomorrow evening. The closing session is scheduled to finish by 18.30 on Saturday. You can explore the entire, vast schedule on the ECREA 2016 website. The session abstracts, however, are only available to registered attendees. 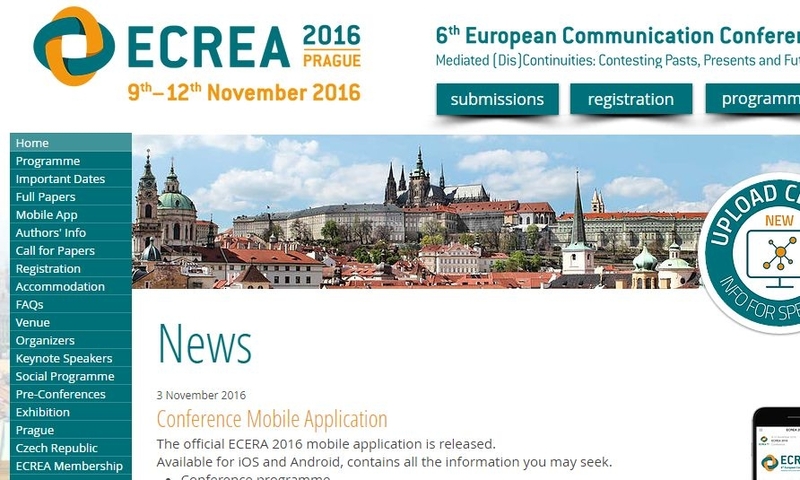 Journalism Research News will also be at ECREA 2016: we will be showcasing JRN during the poster session on Friday, between 14.30 and 16.00. Beyond that, we are interested in doing some interviews with our readers, so feel free to chat us up any time! Further information of the conference is available on the conference website. You can also follow up on the event on Twitter: the organisers are tweeting as @ECREA2016Prague, and the designated hashtag is #ECREA2016. The event has also its own Facebook page and a Youtube channel.